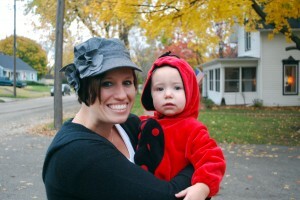 So… we dressed her up in her UH-dorable ladybug costume and took her to spread some sunshine to the neighbors. 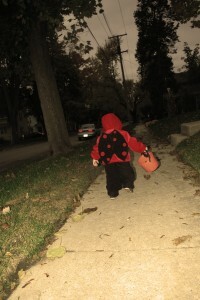 She’s too young to appreciate the candy, but that didn’t stop her from taking it. After trick-or-treating, we headed home so Tobin and I could put on the pig costumes some friends graciously loaned to us. 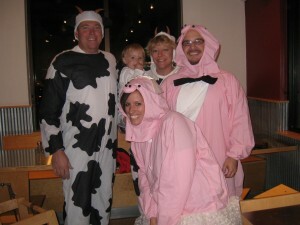 Then we met up with our good friends, Jonny and Kris (who totally rocked their cow costumes), and we all headed to Chipotle for $2 burrito night. assing as I thought it might be. We just had a really good time. Although next year, I’ll come up with something a little more creative. What Did YOU Do Before Church Today?! A little late, too, which was so nice. I love the days when Mae sleeps ’til 8…it happens often on Sundays. But that’s when our Sunday morning normality ended. The short story is that we’ve been looking for a second car. Tobin found one that we were sure would get snatched up immediately, and the price was so good that we decided we needed to see it. And the car was 25 minutes away. We got to the guys’ house at 9:45. Tobin looked at the car, drove it a bit, made an offer. At 10:00, we drove to the bank which, thankfully, was literally around the corner. At 10:15 we returned with cash to pay for the car. ith five minutes to spare. Tobin missed the opening praise but was there by 10:55. It’s funny… that we woke up, bought a car, and went to church. ing them all in tomorrow. To be honest, I would love to have a virtual coffee date with you all right now. Unfortunately, I’ve reached my max for caffeine with an Americano and a Diet Coke, both since 2:00 today, and I need to sleep tonight. Enough said. Instead, we can just talk while I finish up my late-night, day-off snack of tortilla chips and melted, buffalo flavored Velveeta. Seriously, it’s good, but I was also raised on processed cheese, so I think it always tastes good…I think certain friends I have who were raised on dairy farms would disagree with my thinking. 😉 I will tell ya, though, that over in Indonesia, I missed Velveeta so badly that I once had a friend bring me a huge two pound block of it when she came back after Christmas one year. It was glorious. And I didn’t share…at all. I’ve been trying to pull three mile runs in the mornings when I go out. That’s almost double what I was running for so long that it feels like a lot. The good news is, I think I might actually be ready to run this 5k next weekend. I’m not looking forward to running in the cold…or being cold, in general, but I do like the whole chocolate everywhere thing. I WILL run for chocolate. And as a bonus, since packet pick-up is only Thursday and Friday, and since I also have praise team Thursday night, Tobin took Friday off. We’re gonna trek downtown, pick up my stuff, then go check out an Indonesian restaurant…possibly the only one in all of Chicago. Bring on the sate and rendang and pisang goreng…woohoo! I could not be more excited about Indonesian food. And I NEVER got excited about it when we lived there. Funny. 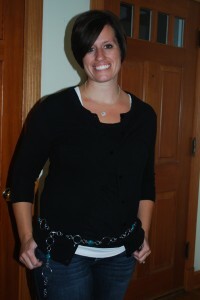 While I’ve tried to not obsess on the blog about weight loss, today was monumental. I’m a pound UNDER my pre-baby weight. I saw a number on the scale today that I thought I might never see again…and I loved it so much that I went for a three mile run…and then ate a bagel. (It was worth it, since I know you’re all wondering!) And tomorrow night at my weekly workout with friends, we’re gonna celebrate with these. If you’ve never tried one, you should. 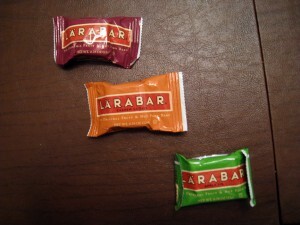 For an energy bar, they’re pretty amazing. And I like that they’re not full of grainy stuff…I don’t feel like I’m eating cardboard. So I love my daughter. it too long. I always enjoyed my afternoons when she was napping because I could catch up on blogging and squeeze in some strength training and shower before she even woke up. Thankfully, she is generally JOYful just to run through the house and get into things. I love that about her, minus the getting into things part. 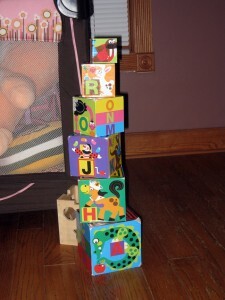 😉 And just look at what she built all by herself today…she truly amazes me. Every year I spend $1 in the Target Dollar Section. (Ok, ok, so I spend a LOT more than a dollar every year, but THIS dollar is for something specific…) I joke that it’s the best dollar I ever spend…but that might be true. 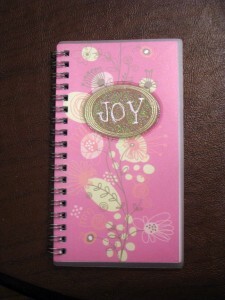 I buy a little day planner that’s the perfect size…I write my life in it and take it everywhere I go. I actually bought one at Michael’s a couple weeks ago because Target didn’t have theirs out yet, but as I was wandering through the Dollar Section today, I saw this. And I totally spent another dollar because it’s way too perfect. After a day like today, JOY is hard. My heart is not ok, and I’ve cried more than I want to admit. I feel broken, I feel lost…and the only thing remotely salvaging tonight is the fact that I know God is there…and that He’s able to fix broken and find lost. And His mercies are new Every. A night of praise music. A quick visit today with some dear friends from Indonesia. Learning discipline in some areas…and seeing the areas in which I still need it. A day in the 50’s, giving me an excuse for flip flops tonight. Seeing God’s purpose for something…after the fact. A tired girl who will (hopefully!) sleep in a bit tomorrow morning! Missing Indonesia…and remembering how wonderful it was. Thanking God for blessings today. I was chatting with a friend today and remembered that we had this. To be honest, it’s kind of embarrassing and yet, at the same time, a wonderful memory. I am hugely pregnant, SO not a beautiful pregnant woman at all, AND I talk about sweat running down my nose. So, ignore the weirdness that we are, and enjoy the beautiful beach and Maelie’s first “trip” to Bali. my creative streak is coming back. 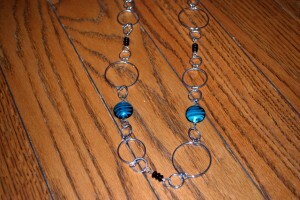 Awhile ago, a friend bought a necklace/belt (yeah it was both) that I was kinda jealous of. (Ok, ok…so I was really jealous of it.) But I also thought, hey, I can probably make that. took the longest to decide how I wanted it to look. Putting it together was easy. And I’m pretty stinkin’ proud that I made it for about 1/6 of what I would have paid for it.
? I’m thinking about selling them…really. I am not the most stellar book-reader. very cute when she is being read to. God gave me a little gift tonight. Oh, I do love a good thunderstorm. So I’m curling up on the couch under a blanket and having a little chat with you all before I hit the hay way too late. it’s making me re-evaluate my idea of balancing things. I made a small-world connection last week at Firefly with a guy who is shooting a movie, and he wanted to use the exterior of our house for a few scenes. He shot a couple of them today, and it was cool to kind of see what goes on with something like that. In chatting with him after that, I found out that he graduated from college with one of my good friends that I taught in Indonesia with. Small world just became microscopic. Goodness, connections are funny things, huh? Sundays just make me really happy. I love going to our church…and while no service is perfect with a 16 month-old, I always leave feeling challenged and encouraged. This Sunday made me even happier because after Mae was down for her afternoon nap, I wrote my Patch article and took a nap myself. It was wonderful, and I fell into such a deep sleep that I had a very hard time waking up. I had the sudden realization today that next month is November, and I’m not sure what to do with that. I suppose I should look on the bright side and realize that I can decorate for Christmas…I really love putting up the tree and decorations. alling asleep during a thunderstorm. I wish they could happen every day. I might actually be ready to RUN an entire 5k in two weeks! d? Strawberry, or as she says it, strawbaby. Too cute! My creative juices are definitely flowing again! I finished the necklace I was working on today and even made myself a pair of funky earrings, which I was going to post a picture of… but I forgot. Maybe tomorrow. I can’t wait to keep creating! Facing a situation recently where I was able to choose JOY. A chat with a friend today that encouraged my heart. God’s Word…and how He truly does give us an answer for everything we might be facing. Sleeping in ’til 7 tomorrow…hopefully! Three less loads of laundry to fold. Answered prayer and new opportunities. An idea for my Patch article.